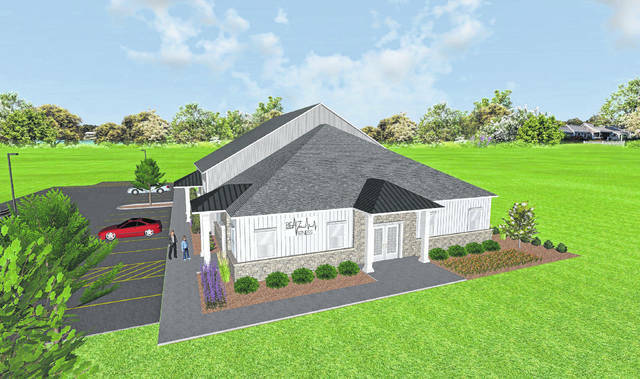 Pictured is an artist’s rendering of Beatz Studio, a new fitness center to be built at 80 Clairedan Drive in Powell. City Council approved the studio’s combined preliminary and final development plans on Tuesday. For residents living in and around the City of Powell who enjoy a good workout, there will soon be another option to choose from after City Council signed off on the construction of Beatz Studio on Tuesday. According to the combined preliminary and final development plan for the site, which was approved by a 6-0 vote (council member Jim Hrivnak abstained due to a conflict of interest), the business will construct a 4,672-square-foot building with the option in the future to build another 4,200-square-foot facility on the site. Rocky Kambo, the city’s assistant director of development, said the plan meets the Wolf Commerce Park Development Plan and all other requirements, including the required 34 parking spaces. Council adopted an ordinance accepting the annexation of 1.1186 acres from Liberty Township to the city. The land in question is occupied by a Verizon Wireless retail store located adjacent to Bunker Lane near the southeast intersection of Sawmill Parkway and Seldom Seen Road. Additionally, council approved an ordinance authorizing Lutz to convey a .098-acre tract of land on Grace Drive to the Powell Community Improvement Corporation to provide for its subsequent conveyance to DJCF Holdings, LLC. Last month, council approved DJCF Holdings’ development plan to build a 3,000-square-foot building to house the Ill Mannered Brewing Company, a plaza tenant on Grace Drive that has outgrown its current space. • Tom Curtin, Preservation Parks of Delaware County executive director, updated council on the park district’s upcoming ballot issue — a 10-year tax levy that includes a 0.6-mill renewal and an additional 0.3 mills. Curtin said voters should be aware that the levy will be based on 2016 property values, not the new evaluations. He also mentioned the park board has voted in favor of establishing a grant program for political entities interested in applying for funds for multi-use bike trails. • Delaware County Sheriff Russell Martin provided council with a “high-level overview” of the county. “Overall, I think the quality of life in the county continues to be good,” he said. Martin added while the county is facing discouraging news in regard to drug addiction issues, there’s been encouraging news in terms of overall crime trends. Countywide, he said, the following crimes are trending downward: breaking and entering, burglary, forgery of bad checks, and theft from vehicles. Shoplifting, however, is on the rise due to new retail establishments like the outlet mall, Martin added. • Council passed a resolution authorizing Lutz to enter into a sewer maintenance agreement with the county and Liberty Township for storm sewer improvements installed under Hunters Bend (straddles city and township boundaries) in The Reserve at Scioto Glenn subdivision on the city’s northwest side. “All this agreement does is it clarifies that this is a city sewer, and the city is responsible for maintaining it just like we do with all other sewers within the city,” Lutz said.